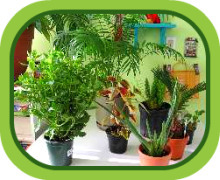 You can use the form below to ask your houseplant questions. I'll do my best to answer within a day or two. If I don't know the answer, maybe another Indoor Gardener will. Or I'll search until I find the information you need. I'll publish your questions and my answers after editing them for spelling, grammar, sequence, and sense. If you don't want your first name published, just let me know and you can sign it Anonymous. For plant identification questions: There will soon be a separate form for this; in the meantime, you can send the photos using this form. I must admit, I'm not the best person on identifying houseplants from photographs, but I'll give it my best shot. Maybe another Indoor Gardener visiting the site will be able to help. To ask your question, please fill out the form below And come back soon to read the answers! There are lots of new pages in the works, so please bookmark us or subscribe to the RSS feed by clicking on the orange RSS button at the top of the Navbar on the left. You don't have to use your email, and you'll be informed every time new info is added to the site! Here's your chance to ask your houseplant questions. Please share them with other visitors to Indoor-Gardener.com so we can all learn together and share information and expertise. There are no dumb questions, so ask away! What's the question you'd like to ask about indoor plants? Sharing your questions helps everyone. Please type here. I'll edit for spelling, grammar, and sense, then publish your question on Indoor-Gardener.com. As I mentioned above, I'm not great at identifying plants from photos. But maybe another Indoor Gardener will be able to help. Click the button and find the first photo on your computer. Select it and click on the button to choose it. Keep the size to no more than 500px wide. I am trying to copy a heart shaped leaf philodendron that was wrapped to have a total uniform appearance - just gorgeous. Any ideas? How often should I water my philodendron? What will Grow in a Dark, Warm Room? What causes horizontal cracks in leaves? I've seen these on several different kinds of plants including English ivy and my rubber tree. How to care for Hoya carnosa? What type of plant is this? What do I do about my ficus which seems to be dying after my cat peed in the soil? How can I save these plants?